Riversand PIM is a powerful business platform that is essential in today’s environment where content and commerce are very related to each other. Both businesses (Manufactures, Distributors and Retailers) and consumers benefit from robust, comprehensive, recent, and accurate product information. The software features an easy to use interface that makes product information management processes simple and fast, such as bulk changing products, adding and removing details, updating product information and more. With Riversand PIM, companies are able to effectively manage information on the products, enabling them to come to smart decisions and take decisive actions on procurement, selling, and marketing. For consumers, having access to complete and detailed product information helps them make the best purchases and investment decisions. In today’s business world, content and commerce go hand in hand. 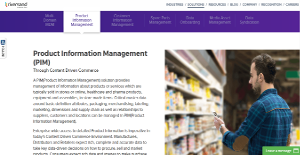 It is imperative for companies and consumers to have easy and fast access to most recent product information to help them drive their decisions. Riversand PIM gives you a feature rich, user-friendly product information management platform that easily bridges content and commerce with rich, complete, and very precise data. As demand for more information increases, the need to make information accessible, accurate, and relevant becomes imperative. This software helps you achieve just that. Riversand PIM utilizes innovations and advanced technologies to help boost your New Product Introductions (NPIs) by as much as 300% while bringing your NPI timelines down to 80%. Riversand PIM helps companies achieve faster time to market for catalogs as well as quicker implementation of their merchandising strategies. The software also accelerates the completion of Supplier Data on-boarding. With data no longer complicated, companies are able to further improve transparency and expedite as well as simplify integrations. Consumers don’t have to spend significant amount of time to search for the most relevant information. Riversand PIM enables you to simplify information search and navigation, allowing your end consumers and potential clients to find what they need in an instant and not having them dig through tons of useless data. If you are interested in Riversand PIM it might also be sensible to examine other subcategories of Best Product Information Management - PIM gathered in our base of SaaS software reviews. Enterprises have unique needs and requirements and no software solution can be just right in such a situation. It is pointless to try to find a perfect off-the-shelf software product that fulfills all your business wants. The smart thing to do would be to adapt the system for your special needs, staff member skill levels, budget, and other elements. For these reasons, do not hurry and pay for well-publicized leading systems. Though these may be widely used, they may not be the best fit for your unique wants. Do your research, investigate each short-listed system in detail, read a few Riversand PIM reviews, call the vendor for explanations, and finally select the product that provides what you require. How Much Does Riversand PIM Cost? We realize that when you make a decision to buy Product Information Management - PIM it’s important not only to see how experts evaluate it in their reviews, but also to find out if the real people and companies that buy it are actually satisfied with the product. That’s why we’ve created our behavior-based Customer Satisfaction Algorithm™ that gathers customer reviews, comments and Riversand PIM reviews across a wide range of social media sites. The data is then presented in an easy to digest form showing how many people had positive and negative experience with Riversand PIM. With that information at hand you should be equipped to make an informed buying decision that you won’t regret. What are Riversand PIM pricing details? What integrations are available for Riversand PIM? If you need more information about Riversand PIM or you simply have a question let us know what you need and we’ll forward your request directly to the vendor.